Hello, everyone! Wow! You all certainly have proven to us just how excited you are about this months release! We have pickers and packers that were already heading in early this morning to start getting your orders out, so you shouldn't have to wait too long for your goodies! What do you have for plans for the rest of the weekend? I am heading out early this morning to fly into Kansas City to see my very dear friend, Dawn. Just for a few days. I am so looking forward to taking a few days off to hang out and allow Dawn to introduce *her world* to me. It should prove to be full of fun & laughter; I can hardly wait! In the meantime, I was perusing the design team galleries this morning and I just couldn't let a few of the projects go without some love. Every single month these ladies use sets in ways I never could have imagined. Makes you just want to clear my schedule and get inky all day, doesn't it?!?! Michelle Wooderson used one of my new favorite color combinations, Aqua Mist & Terracotta Tile. Aren't they SO pretty together? I also love how she use this large leaf from Turning a New Leaf paired with some of the small flowers & centers from Beautiful Blooms. Dawn McVey makes a huge impact with the new Big & Bold Wishes set. I love how she used several punched circles to create a large scalloped circle. It makes for such a fun look, which I am just DYING to try out myself! You can see a subtle use of Background Basics: Diamonds in the back too. 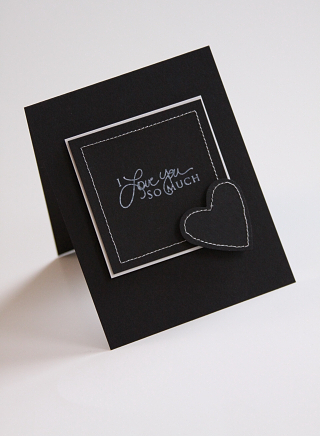 Becky Oehlers kept it super simple with this little black& white card that features Dawn's new Signature Greetings. Just a little simple stitching reminds me that cards don't need to be overly complicated to get a beautiful statement across. 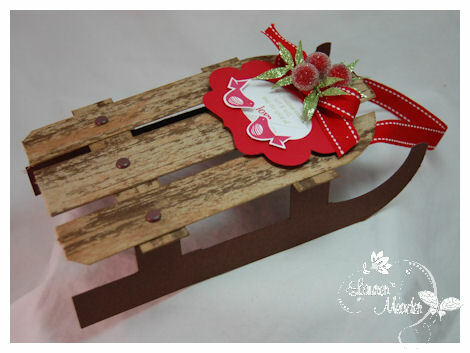 Betsy Veldman created this stunning folk-style project using elements from Christmas Friends. I love her choice of color scheme (as I always do), plus the different patterns and textures that are layered in strips at the bottom of the card, LOVE that! And is that a bit of Background Basics: Diamonds I see peeking out there? 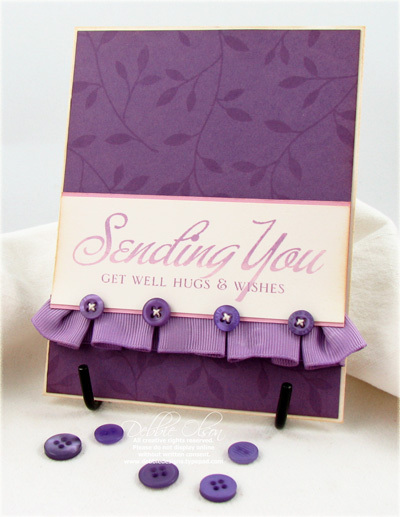 Debbie Olson created some absolutely stunning pleats on this card, using Plum Pudding Ribbon. It helps to add emphasis to the already big sentiment from Big & Bold Wishes. Makes me want to get out some ribbon and buttons..how about you? 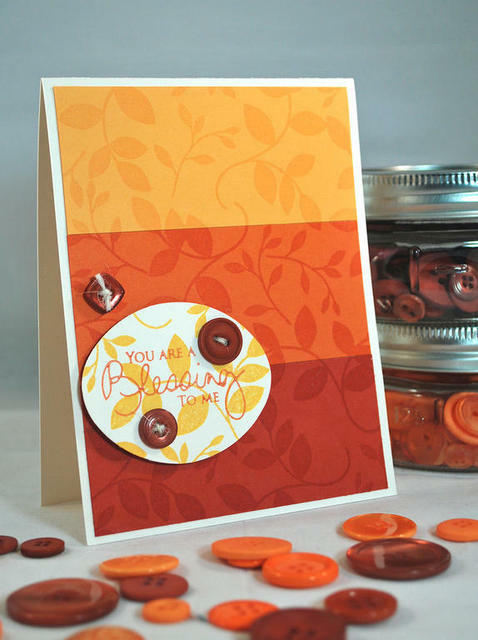 Here, Geny Cassady used Taking a New Leaf to create this amazing variegated card. I love the way she faded from Summer Sunrise to Orange Zest to the new Terracotta Tile. Almost reminds me of a sunset! 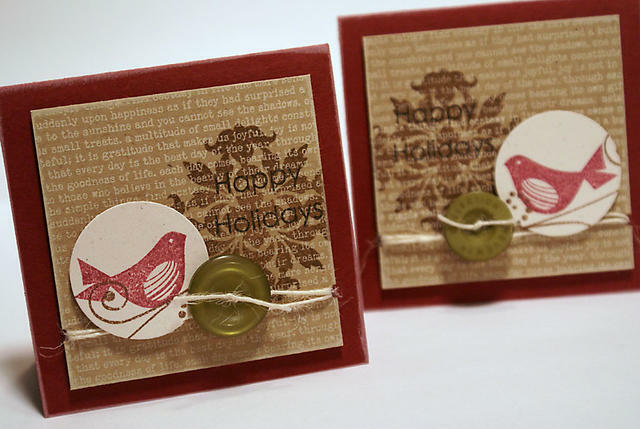 Heather Nichols used Christmas Friends to make these sweet little gift tags. Do you not just love when she makes those? The layering of Background Basics: Text Style II and Giga Guide Lines is SO pretty and provides such a nice back drop for that little bird! Lauren Meader built an entire sled from paper and decorated it very simply with a label embellished with Christmas Friends. Sometimes I think there is truly nothing that this girl can make from paper! 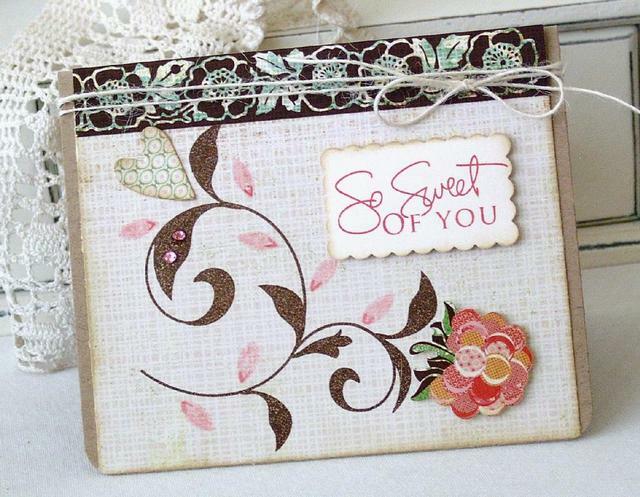 Niki Estes paired the vine images from Turning a New Leaf with Beautiful Blooms to create her own elegant patterned paper. It was also nice to see the sentiment from Spiral Bouquet dusted off and used as well. Such a fresh color scheme! 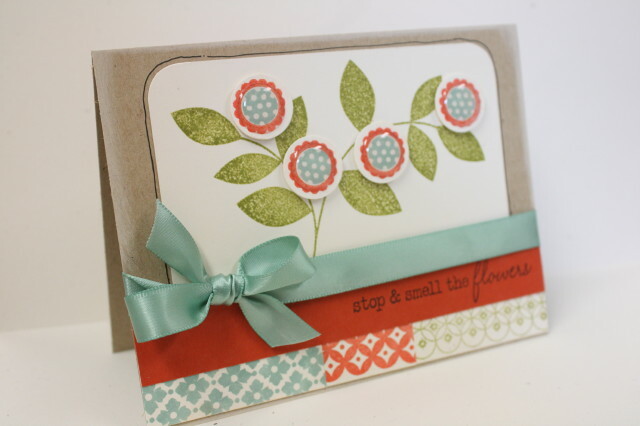 Last, but certainly not least, Melissa Phillips used the spiral vine from Turning a New Leaf as a canvas for a few small embellishments. She really shines a light on why I love this set so much. It really acts as a springboard for so many applications and styles! And of course I can't forget the addition of one of the Signature Greetings sentiments either! Well, there you have it! Some of my favorite team projects. If you haven't already done so, I hope you will take a look at What's New in the store and peruse through ALL of the design team members November projects. They are truly inspirational!!! Have a wonderful weekend and don't forget to stamp something today! Beautiful projects ladies! Thanks for another great realease Nichole! Fabulous cards. Thank you all for making this yet one more FANTASTIC month of beautiful new products! Have a nice trip and a lot of fun, Nichole. I tuned into the release last night and “observed” the fun & frivolity that abounded before and during the release, and was able to place a very large order for MY faves. I must tell you it was a challenge to rein myself in at the checkout; there were so many wonderful new goodies to pick from, and only so much moolah to spend. The DT continues to out-do themselves each and every month. I don’t know how you do it, but we all love it. Congrats for another fab release! Awesome cards by the DT. I love all the different styles. Thanks for sharing! The new release is wonderful. Can’t wait to receive my goodies in the mail. Really beautiful work by all. Wow!! Thank you for taking the time to share them. More incredible work from the design team, they truly are the best ever! Hope you have a great trip. Thanks for another fabulous month! Last night was a blast! Today is another treat for my eyes. These projects are beautiful. Glad to hear you are getting some “girl time” after all this craziness. ENJOY! Ohh, that will be so much fun – can’t wait to hear all about the trip! I wish I had just a smidgen of yours and that DT’s creativity! The creativity keeps on flowing! I’m so impressed – thank you ladies! These are all so gorgeous! Thanks for the inspiration. Another day after a release and I can not wait to get my hands on my order and “get inky!” Such great inspiration, such wonderful products, such amazing artists! Have a great time with Dawn! Can’t wait to see what you guys think of while you are together! I’m loving these ‘The Morning After’ posts Nichole, please keep them up! Love getting a bit of an inside scoop on how the release was for you and also seeing you pick out the best gems from the DT’s creations. They are all stunning as usual!! Yes, it so makes me want to get inky! 🙂 And that day for me is usually Monday as weekends are so hectic, the opposite of most folks . . .Love the morning after post. So much wonderful inspiration! Thanks for this great post, this month`s releases are amazing again! Can`t wait to get my ordered goodies and start playing with them! Really beautiful cards! Wishing you a wonderful time with Dawn!! Oh… and BTW…. i think the new release is really awesome, i can’t wait to receive my goodies in the mail….!! just gorgeous cards that are truly inspiring…. These are fabulous! I just now finalized my order (after working on it to keep it within my budget…tough job!). Can’t wait to try out these ideas…thanks, Papertrey! You are all wonderful! Nichole, have a wonderful trip! Love the detail of each of these creations! Wow, such a talented group of designers who truly love their art form. I am certain that you are really tired after all of the deadlines and stress of a release. Go and have fun in Kansas City! I am sure taht you and Dawn will have a wonderful time. Thank you again for all of the hard work that your and your ENTIRE STAFF for jobs well done. Gorgeous cards, I LOVE THE PURPLE CARD!!! I love your blog,and all others products in papertrey ink. 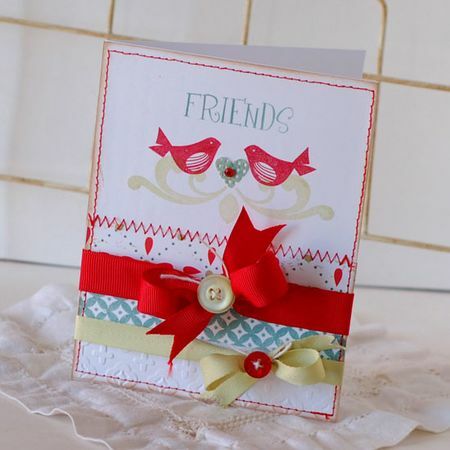 your creations,cards,projects…are fabulous.Thank you to share with us your “addiction”.Sorry for my english,I’m french.You can see my cards with papertrey ink stamps on my recent blog. I really loved this month’s release. It is always fun to see what your entire team whips up with the beautiful stamps and papers, buttons and lovely ribbons. Oh, I can go on and on….and never stop. Thanks for all you guys do here at Papertrey. I always look forward to reading you blog each day. Each day is filled with tons of inspiration and ideas. I am looking forward to what CHA. I am sure you guys have lots of surprises in store for all of your readers. Love all your cards especially the purple one.